Last saturday, Chris Bock (awesome guy that I barely know) organized an alleycat for the 5th anniversary of Rock (other great guy I don’t know) working at Flash courier. The next thing I had to do was take into consideration that obviously a pickup has to occur before its corresponding delivery. With only 4 pickup-delivery pairs on the race’s manifest, this is easy enough. Were there more, it would be a NP-hard problem1. As you can see on the GPS tracking, even after having carefully prepared my ride, I still took some questionable decisions. The small hook at SechseLäutenplatz is an obvious example. I fucked up because of the construction work going on there. 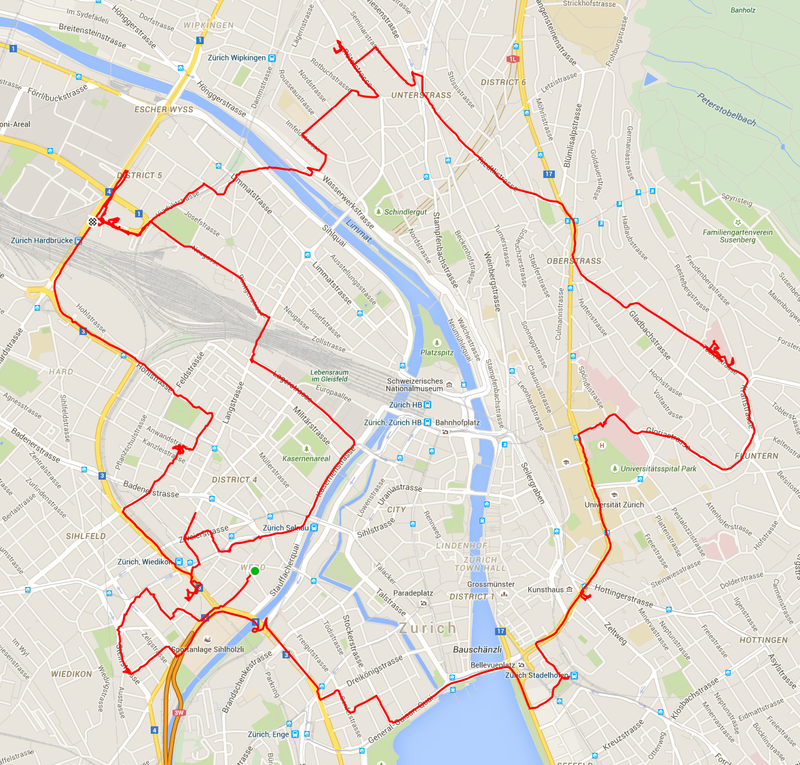 The ride down from Rötelstrasse to Geroldstrasse was a bit random as well. And then finding the nº126 of Werdstrasse was even more random. Werdstrasse makes no sense! 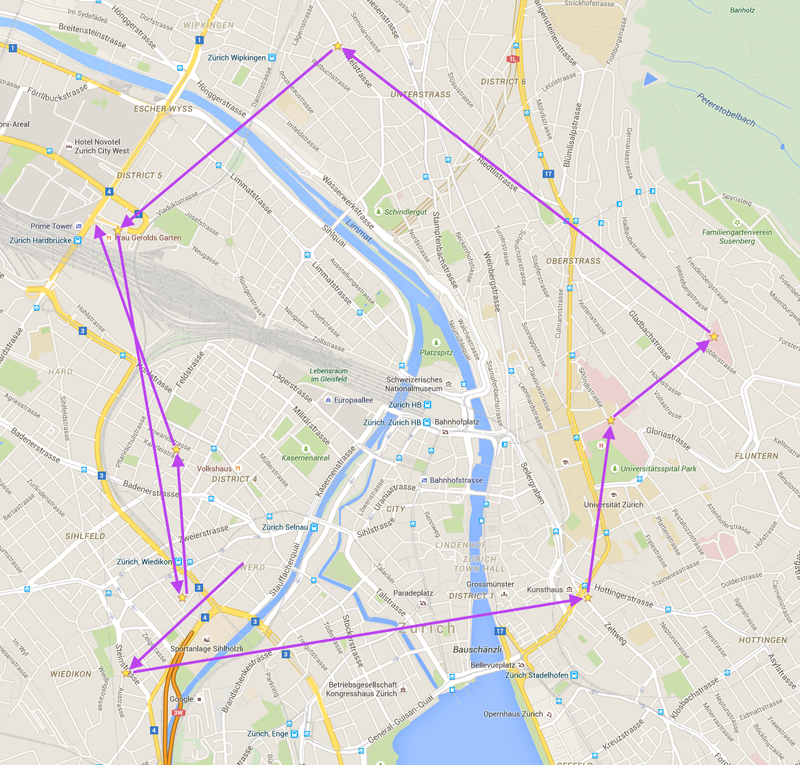 Overall you can see that I don’t yet know the city well enough, because I mostly took large main roads. 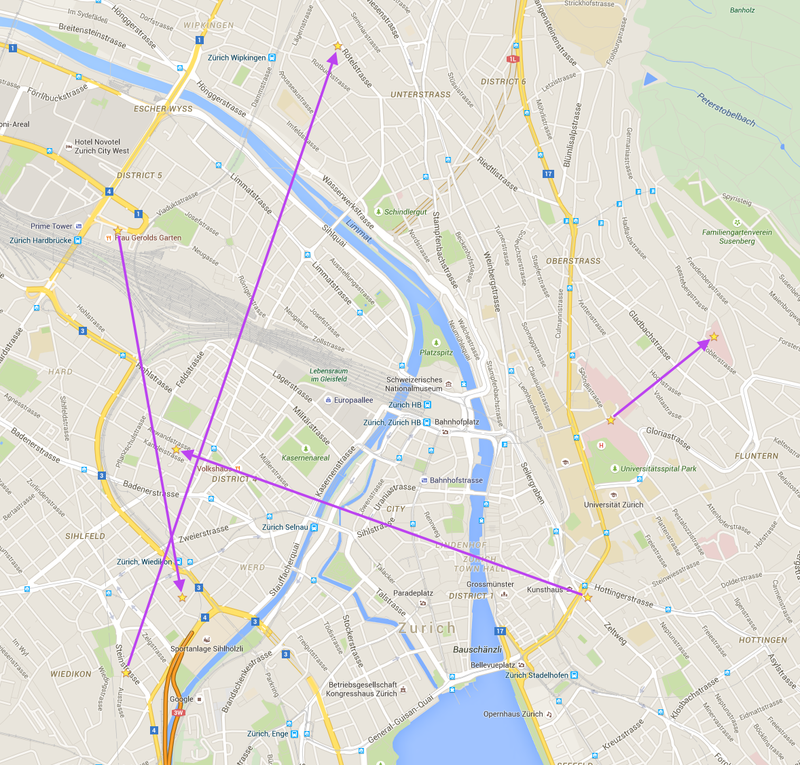 I’m pretty sure a Züri messenger’s route looks way different. Steinstrasse 50: this is the World’s End tattoo shop. We got a temporary tattoo that we’d have to show at Rötelstrasse 69. Zeltweg 5: this is the Schauspielhaus Zürich. We got a entry ticket that we’d have to drop into a cardboard box at Engelstrasse 49. Schmelzbergstrasse 12: this is the Uni Spital. We got a fake blood or urine sample that must be delivered to Toblerstrasse 51. Toblerstrasse 51: the first 3 pickups went pretty well, I found the places pretty much directly. Here however, I first couldn’t find the checkpoint. I was looking for it at the actual address, Toblerstrasse 51, which are the Viollier labs. Turns out, the checkpoint was a bit further down the road. There you could drink the blood (vodka) or urine (martini). Rötelstrasse 69: a bunch of friends of Rock’s I guess? Geroldstrasse 17: that’s the Freitag flagship store. The goal was to go all the way up to the truckspotting balcony get a Freitag paper bag. This had to be dropped off at Werdstrasse 126. Werdstrasse 126: some art gallery or something. Again, I didn’t see the checkpoint right away, even though I was at the right address. But this time, it was entirely my fault. Engelstrasse 49: the manifest gave a gate code for the appartment building and said that you have to go into the courtyard look for a 666 box. So I went in, but couldn’t find anything! Turns out the box was right on the gate. Again, I didn’t see it! I have to pay more attention. At the end of the alleycat, Chris told me that the idea behind the checkpoints was to bring us to places related to Rock (the Schauspielhaus, the tattoo shop, the Freitag store) or to the some standard deliveries that happen during shifts at Flash (Viollier, Uni Spital). Pretty neat! I had a great, fun time. Kudos to Chris!